Learn More About the World's Favorite Beverage! If Costa Rican coffee is one of the things you are most looking forward to on your trip, then this tour is for you! Costa Rica has a long history with the “grano de oro” (golden bean), and, in fact, the country would not be the same if this Ethiopian plant had not made its way to its shores. Production started in the late 18th century and was an significant source of revenue–and economic development–by the 1820s. Today, it continues to be an important crop. Costa Rica grows only arabica coffee, and its harvest is considered one of the best in the world. 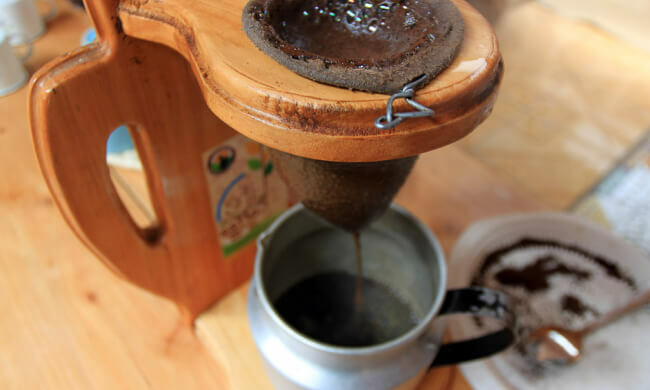 You can learn more about the history of Costa Rican coffee in our Travel Guide. This tour will help you understand the entire production process for one of the world’s favorite drinks. You’ll start with a lovely drive through the La Fortuna valley, where you will see scenic rural views including cows at pasture, rivers, and forests. Once arriving at the educational farm Vida Campesina, you’ll be shown around the installations and get started learning about coffee. Your guide will start with a historical overview, then lead into an explanation of the crop itself, as well as methods of harvest, selection, and washing of coffee beans. And trust us, it’s more complicated that you would think! Next up–drying and roasting, and then a taste of incomparable Costa Rican coffee. This tour is great for all ages. Minimum 2 people. Tour includes: Round-trip transportation, bilingual naturalist guide, beverages, snacks. What to bring: Comfortable clothing for walking, hiking or tennis shoes, binoculars, camera, sunscreen, insect repellent.